Seven African Ambassadors, as well as State Department officials, and leading think tank analysts on Africa met last week to discuss how African countries are facing the diverse and complex challenges to human and economic development on the continent. It was a timely event as King Mohammed VI of Morocco was visiting four of the countries whose ambassadors participated in the event. 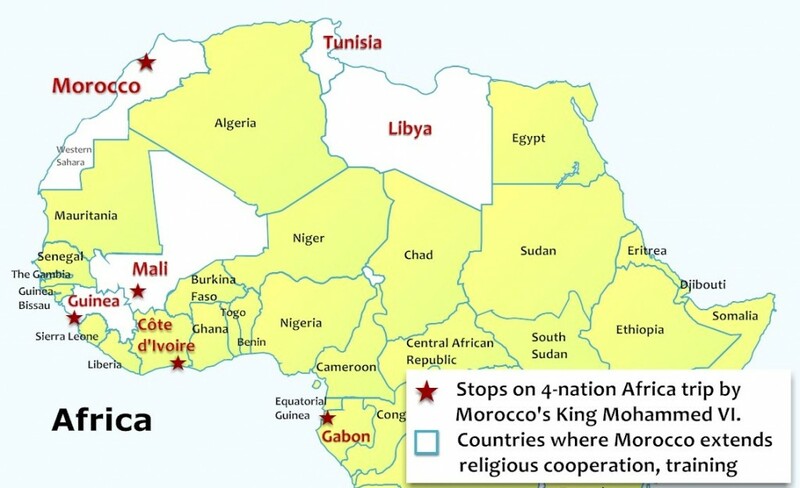 Since the Africa trip began on February 18, Morocco has signed more than 80 economic, commercial, and technical assistance agreements with Mali, Cote d’Ivoire, Guinea, and Gabon. The Morocco sovereign’s message of the need for regional and international partnerships to achieve growth targets was broadly supported by the Ambassadors at the roundtable. Ambassadors H.E. Michael Moussa-Adamo of Gabon, H.E. Rachad Bouhlal of Morocco, H.E. Stanislas Moussa-Kembe of the Central African Republic, H.E. Serge Mombouli of the Congo, H.E. Cyrille S. Oguin of Benin, H.E. Cheikh Niang of Senegal, and H.E. Daouda Diabaté of Côte d’Ivoire joined Dr. J. Peter Pham, Director of the Africa Center at the Atlantic Council, Bisa Williams, US Deputy Assistant Secretary of State for African Affairs; and Ambassador Michael Battle, senior advisor for the African Leaders Summit at the US State Department in a broad-ranging discussion of how Africa can achieve balanced and sustainable economic growth and more open political systems. Dr. Pham, who recently chaired an inaugural launch of a project examining the food-energy-water nexus in Africa, noted that perceptions of Africa are shifting as the continent is expected to have some of the fastest economic growth rates in the world in the next decade. From a development perspective, this trend puts great pressure on governments to provide the education, employment, infrastructure, social and health services, and improved governance required to keep the pace. Addressing the need for regional partnerships, Ambassador Moussa-Adamo noted that while cell phone technology has done a lot to bring Africans closer together, the physical infrastructure still keeps Africans apart. He believes that the continent needs to see concrete physical changes starting with building up its transportation infrastructure. This lack of infrastructure has made it easier for an African nation to trade with Europe than with its own neighbors. He also remarked that security issues are an impediment to foreign investors, and that dealing effectively with those issues will attract foreign investors to help build the continental infrastructure needed for stronger economic regional partnerships. Bisa Williams pointed out that Africa’s abundant human resources are a key factor in its growth potential, particularly in the rural areas where 60 percent of the arable land is not being effectively farmed. The problem is not in feeding Africa but enabling Africans to feed themselves and export to the world. The US, she believes, can provide assistance to boost African economies, improve infrastructure, and improve agricultural output. This combination of better infrastructure and land cultivation will lead to food security. Economic development in Africa has many challenges and, according to the participants, many assets with which to address these challenges. Among the key issues raised by the audience are corruption and poor governance which impede domestic growth and act as barriers to attracting needed foreign investment. In addition, African leaders have expressed concerns with the need to address the education-employment gap, ethnic and tribal grievances, cross-border concerns ranging from illegal immigration and trafficking to sharing water resources, and better management of foreign assistance. Morocco is taking important steps to be a full player in Africa’s development, sharing some of the same challenges and having learned many lessons in its efforts to achieve balanced, sustainable human and economic development. The dozens of bilateral agreements signed between Morocco and the governments in Mali, Ivory Coast, Guinea, and Gabon provide potential platforms for effectively addressing key concerns of the countries: creating more jobs with greater rewards, increasing funding to enhance social and health services, promoting moderate Islam and religious tolerance, supporting a broad base of industrial development, and, most importantly, linking together programs and projects across national boundaries. Given King Mohammed VI’s concrete commitments to Africa, Morocco is carving out an important niche that will benefit all the stakeholders in the region. Giancarlo Duffy, Research Associate at the Moroccan American Center, contributed to this article.